M8trix was a dramatic improvement over Garden City Casino, bringing with it a tiny bit of Vegas to San Jose and a colorful new tower. Now it looks like Bay 101 is looking to not only looking to do a similar remodel but move much closer to their gaming neighbor. 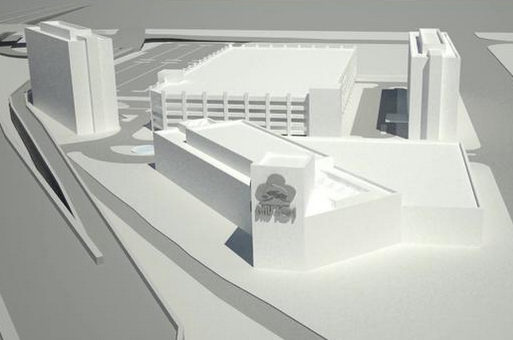 They purchased a 20-acre hotel at 1740 N. First and are planning a 87,000 SQFT card club with two attached hotels with a combined 470 rooms, retail space, an upscale restaurant, and a six-story parking structure. Note that while the card club would be 12,000 SQFT larger than their current home, the number of gambling tables would be the same since the limit is set by San Jose voters. The skyline would also benefit from the two modest hotel towers as one would be 9 stories and the other would be 10, and both would be visible from Highway 101 and probably 880. The new plans will happen in phases (much like M8trix which is also planning a hotel tower and celebrity-chef restaurant) with the card room happening first, followed by the hotels and the parking structure. The location is really ideal for them: no residential neighbors, close to 101, close to the airport, and next to techies along North First. It also would open a development opportunity on the site of the old casino. Looks like a nice project! gotta love that enormous parking garage AND lot. Isn't there a light rail station nearby? These casinos draw people from up to an hour away, so tons of parking is still needed unfortunately. I really hope they add some of the restaurants around the perimeter of the buildings with street access. The parking garage is for the casino/hotels. The lot is slated for airport parking (short/long term). Man, where do these people come from? I'm sure there's a better use of $100M. Boo. So now we're telling developers how to invest their money? Ah yeah, you got the last word.